Tom Pollock, described as “a powerful new imagination” by The Guardian, is the author of four novels and an ambassador for Talklife—the peer support network for youth mental health where he blogs about his experiences with depression, anxiety and bulimia (blog.talklife.co). Inspired by those experiences, This Story Is a Lie is his first thriller for young adults. He lives and works in London, and can be found on Twitter @tomhpollock. "Revelatory about mental health, ingeniously constructed and a thrilling ride . . ."
"Gripping, dazzling, and pulse-pounding, Pollock’s YA debut is a thrill from the first page to the last . . . The final twist is well disguised and truly revelatory." "[A] sophisticated, dark novel . . . Readers who thrill to the combination of mathematics and psychological suspense will be utterly enthralled." "Unrelenting twists and turns . . . Even the last page will keep readers wondering if there's truth to the title." "This shape-shifter of a novel explores the tragic cost of family secrets and lies . . . a fascinating premise." "This Story Is a Lie is easily one of the greatest page-turners I’ve read this year . . . Intensely gripping because of its clever plot and memorable characters." "Tom Pollock displays a graceful mastery of both words and numbers in this brainy, unpredictable, and truly original thriller." "Dazzling. It's as though Escher and Schrödinger had collaborated on a thriller." "Unreliable. Unputdownable. Deeply empathetic. 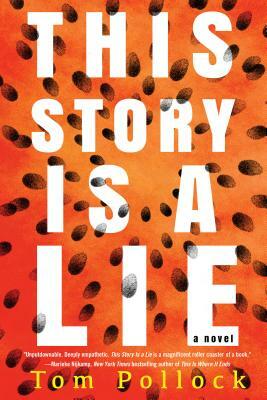 This Story Is a Lie is a magnificent rollercoaster of a book." "Notable for its hi-octane drama but also its thoughtfulness in the story’s quieter moments . . . a tremendous read from start to finish." "This Story Is a Lie is a terrific YA thriller. It’s enjoyable to read, the math underpinning provides solid food for thought without being too daunting for readers who may lack confidence with the subject, and Peter Blankman’s blurred perception of what’s happening to him intrigues us from the first page to the very last." "Readers won’t soon forget this very smart,thoroughly original science fiction action-adventure." "An exceptional and deftly crafted thriller of a read from beginning to end, This Story Is A Lie showcases author Tom Pollock's genuine flair for character and narrative driven storytelling." "Incredible, my mind is blown." "A dazzling, dizzying rollercoaster of a novel, about memory and family and other things you can't completely trust. It will twist your brain in the best possible way." "Exceptional, funny, bleak and emotionally brutal and had me permanently on the edge of my seat." "Taut, suspenseful and compelling . . . A very self-assured and breathtaking debut."